Whether you are looking for gifts for yourself or someone else, here's a few items to get you started. These are ALL items that I use personally and recommend. 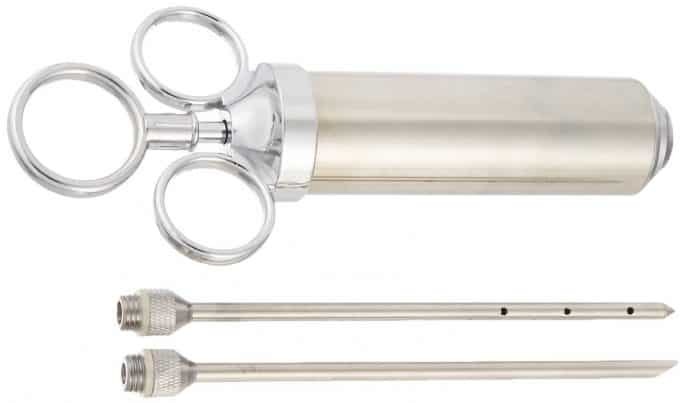 This injector is one that I have been using for a long time and it has quickly become my favorite. Comes with (2) needles, one has a large opening at the bottom so you can have coarse pepper, small pieces of garlic, etc in your marinade and they just shoot right through. In most other injectors, the needles are small and get clogged really easy. The second needle is for finer marinades and injections like melted butter, apple juice, etc. with holes in the side for maximum distribution. Stainless steel and easy to use and clean. If you've never used a charcoal chimney to start your charcoal before pouring it into the grill or smoker, then you are working too hard and not having enough fun! Fill it with charcoal, stuff a piece of rolled up newspaper in the bottom, light it and voila! 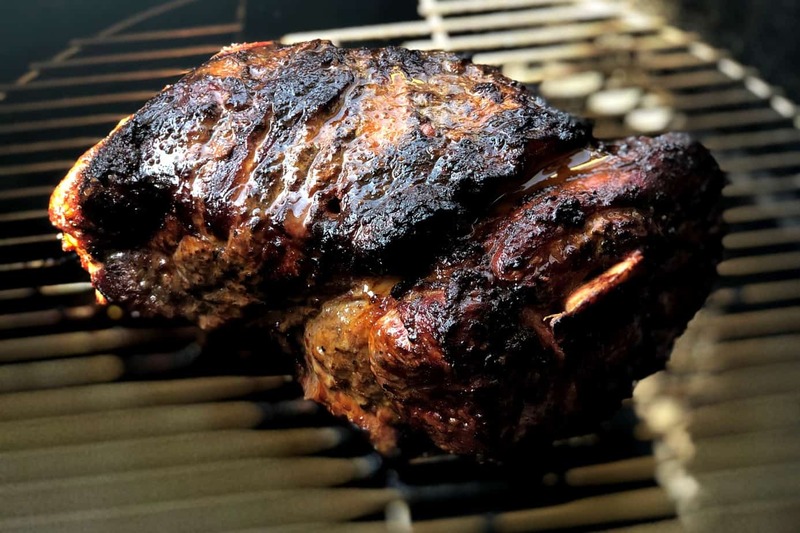 In about 10 minutes you have 4-5 lbs of pre-lit charcoal ready to keep your smoker at that perfect temperature or even sketch some grill marks on a big, juicy steak. What's more.. I use mine with a small grate on top to super-sear steaks at temperatures exceeding 1000°F. That's what I'm talking about! 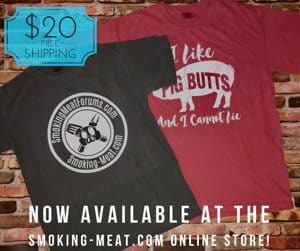 The Smoking-Meat.com OFFICIAL logo tee is here! Charcoal or crimson colored t-shirt with the SmokingMeatForums/Smoking-Meat.com logo printed onto the front. Made of soft, durable cotton in the perfect medium weight, this will quickly become your favorite t-shirt. 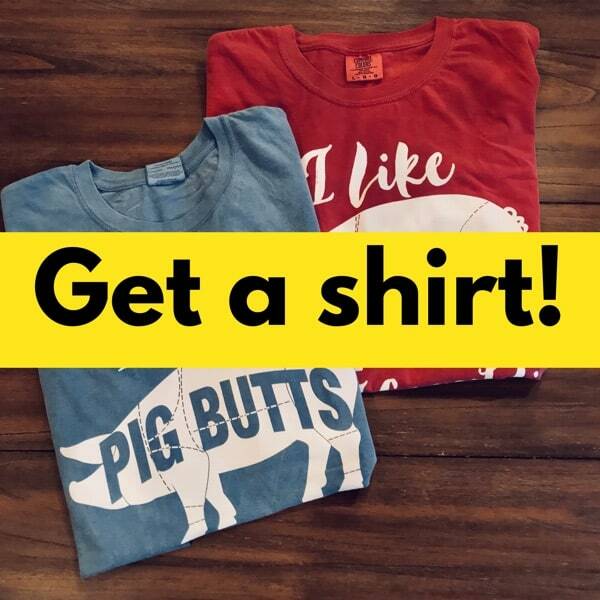 Our PIG BUTTS t-shirt is made from the same quality cotton as our official logo tee—soft, durable, and a comfortable medium weight fabric. It comes in crimson or denim blue. All t-shirts are available in sizes S through 3X. Supplies are limited, so order soon. To me it just makes sense to place the meat on a pan with grooves, holes, etc which will let the smoke through and still hold the meat securely so there's no chance of dropping anything during the cooking process or during the walk out to the smoker or grill. I have been using these pans for several years now and they are indispensable to my cooking. The dishwasher always returns them to that shiny new finish and they are put away until my next cook. Heavy duty, stainless steel and seem to be tough enough to last a lifetime before passing them on to your kids. Note: if they get stained, just use some “Bar Keeper's FriendⓇ” cleaner on them with a non-abrasive scrubber and you'll be back in business. 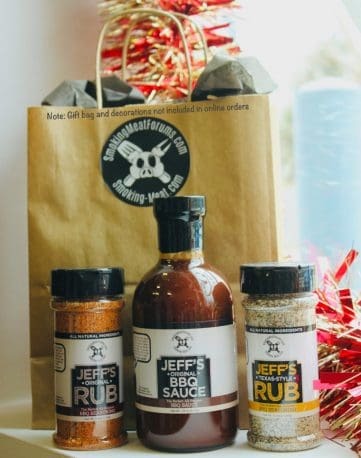 The sampler pack at the Thin Blue Foods store contains a bottle each of the original rub and Texas style rub and a bottle of barbecue sauce. These are a great deal so buy some for yourself or give them out to your friends who love to cook outdoors. 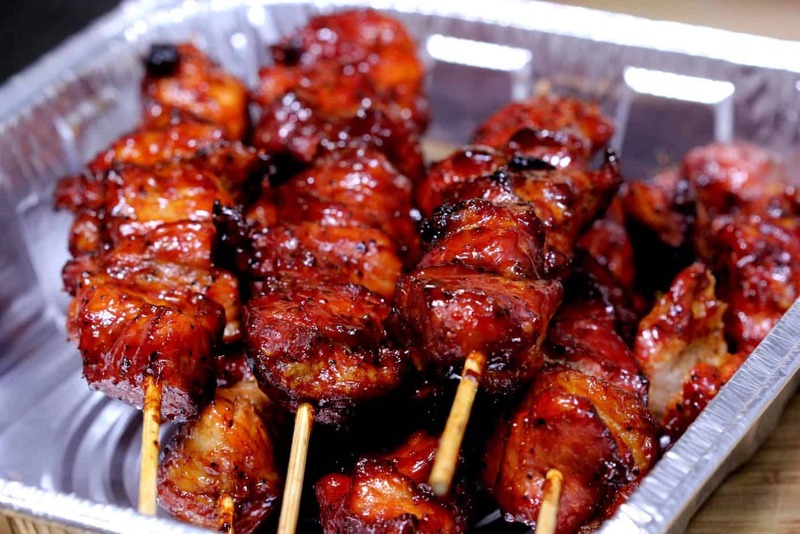 The Original rub is sweet and spicy but not too far in either direction. Just enough to create a great crust on all pork, chicken and even beef cuts like brisket and ribs. The Texas style rub is a savory rub that contains no sugar and is best suited to beef and/or seafood. It also works great as a table seasoning for vegetables, stews, beans, etc. The Original barbecue sauce is sweet and spicy without being too sweet or too spicy and works perfectly as a glaze, basting sauce or a dip at the table. You are going to love all of these products! You've heard me say it before and I'll say it again, people try to make outdoor cooking way too complicated sometimes. Ok, the science is sort of cool to read about but at the end of the day, I just wanna know how to easily cook something in my grill or smoker and have it turn out really amazing. 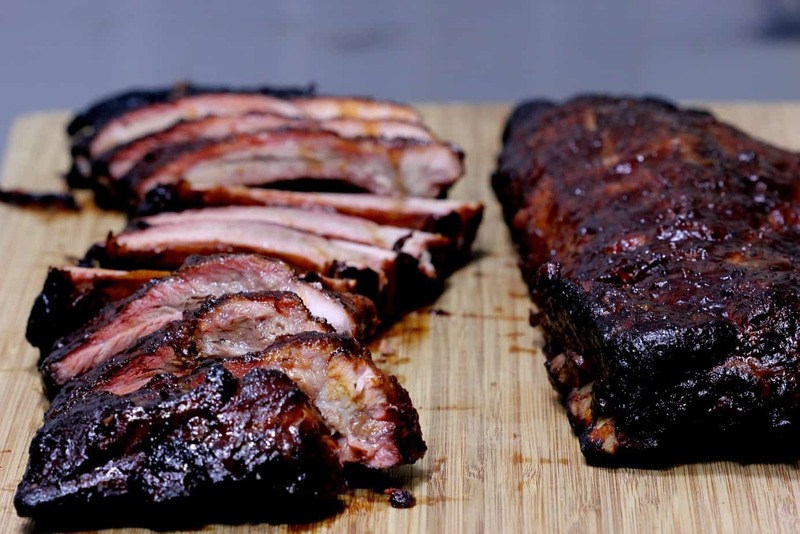 This book not only makes it so easy a caveman could do it, it comes complete with about 80 recipes for the smoker that get great results every time. 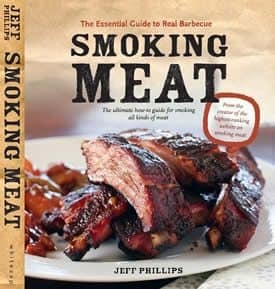 More than 880 reviews and 4.7 out of 5 stars on Amazon speaks for itself.. one of the best smoking meat books available. If you own a smoker, are looking to purchase a smoker or just want to know how smokers work, this book is for you. My brother-in-law bought this knife for me last November and I fell in love with it immediately. The blades are removable so that when they get dull, you just simply replace them with a new one and let me tell you, they are razor sharp! The knife comes with (6) extra blades and one in the knife. I have just used my 6th blade after a little more than 12 months so they do last a little while. 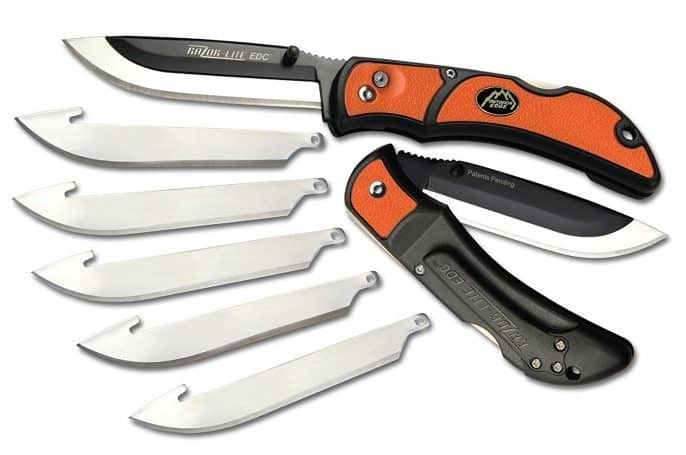 Blade durability will depend on what you are cutting and how often you use it. If you have too much time on your hands and you are really good with a sharpening stone, then this may not be for you. The rest of us need this badly and it's a dream come true where sharp knives are concerned. The blades lock tightly into place and there is no play in the blade left to right or back and forth and they are super easy to replace with the push of a button in about 15 seconds. So you don't want to spend an arm and a leg but you want fast temperature readings that you know are accurate? 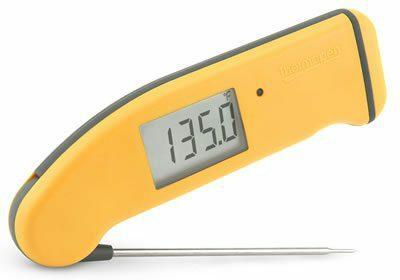 The Thermopop reads in 3-4 seconds, has a battery that will last for over 5000 hours under normal use, rotating display, splash-proof design (IP66) and reads temperatures from -58 to 572°F. As if thats's not enough, this handy little tool comes in 9 colors so you can choose your favorite one or collect all of them.. whatever suits your fancy! If you have trouble getting enough smoke flavor or you just want to turn your electric smoker into a true set it and forget it unit so you can get some much needed rest, this is for you. Fill with wood pellets (like the ones made for pellet smokers), light one end with a torch or lighter and once it's glowing, it will slowly burn for 8-11 hours giving you flavorful smoke the entire time. I have been using this in a Masterbuilt, vault type smoker for a number of years so I won't have to add wood chips every 30 minutes. Now THAT is what I call easy! 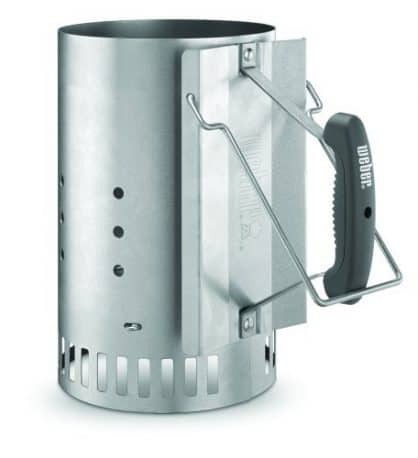 This is also great for producing smoke with minimal heat for cold-smoking things like cheese, spices, etc. So I am inherently opposed to wearing gloves when I work.. it's a great idea but my dexterity goes downhill and I nearly always end up taking them off and working without them. Having said that, if you are handling charcoal, hot grates, things that will burn the skin from your hands, you really have to wear gloves and protect the only hands that you were given. These barbecue gloves by Weber, a name heard often in the grilling/smoking industry will protect your hands so well, you might even forget that the grill is hot.. well, let's hope you don't forget that! 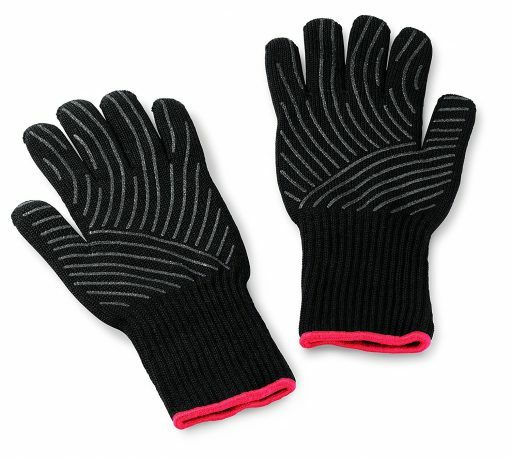 My go to gloves when I am tending the smoker and grill outside, get a pair today! I don't do a lot of indoor smoke cooking but when I do, I look no further than this one made by NordicWare. Heavy duty construction and a great, easy to wipe off finish on the outside will have you using this for years to come. Place about a teaspoon of wood dust in the bottom, place the water pan over the top of that and then the grate. Set it on the burner of your stove, gas or electric, and you'll be smoking in no time. The smoke is very light but is enough to infuse some flavor into whatever you are cooking without setting off the smoke alarms. I do recommend running the exhaust fan over your stove to move the smoke in the right direction. I have smoked pork chops, burgers, steaks and even ribs on this smoker and it really fits the bill when you can't be outside. A rugged, waterproof (IP67), heavy duty temperature reading machine that you carry in your pocket. It is activated by motion, lights up when it's too dark to see and has a battery that will give you 3000 hours of life. Comes in a wide assortment of colors and reads from -58 to 572°F. It's also super-fast and reads in 2-3 seconds. This is great when you have 150 chicken wings on the grill and you want to check all of them to make sure they are done properly. Been there and done that and it was nice to be able to do that quickly and efficiently. 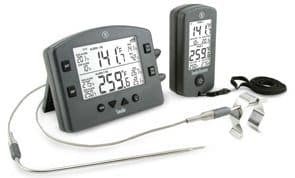 The “Smoke” is a remote, dual-probe, digital meat thermometer where part of the unit stays out with the smoker or grill and the receiver goes in your pocket or around your neck with the included lanyard. 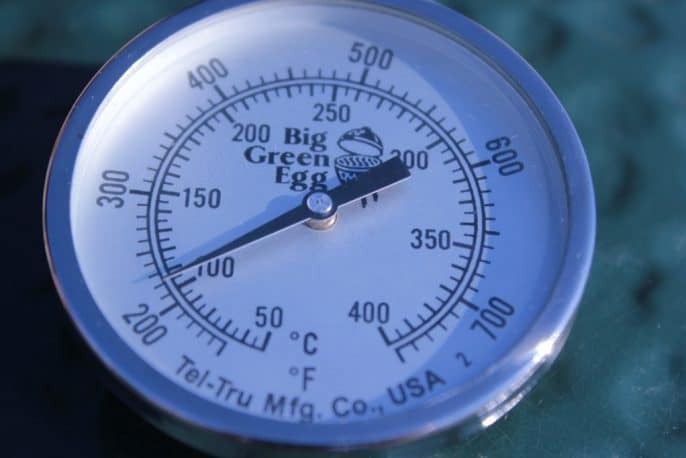 In this way, you can get some other work done around the house and always know what's going on temperature wise in your smoker or grill. The heavy duty construction, splash-proof sealed design, easy to use controls and 300 foot range make this a must have. 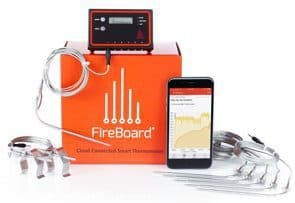 They now offer a wifi gateway for this unit that connects the “Smoke” to your wifi network. In this way, you can go to the store, to work, anywhere in the world if you choose and still be able to monitor the readings of the probes that you are using. This add-on really adds to the usefulness of the “Smoke” thermometer. 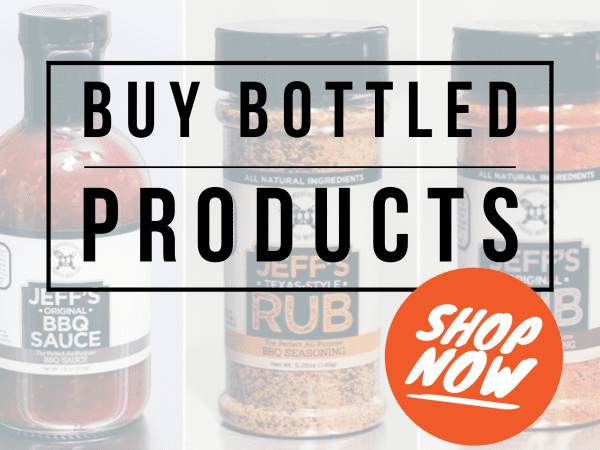 If you like or have an interest in making jerky, fruit leather, etc. 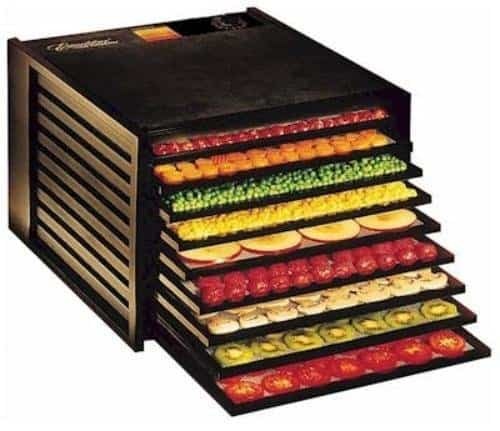 then this 9-tray dehydrator by Excalibur is for you. Unlike many other dehydrators, the fan is in the back and blows across all of the trays at once. When I make jerky or leather from fruit puree, this is the appliance that I use. Each of the trays has a non-stick plastic like liner that is easy to clean in the dishwasher or with warm water and soap for easy cleanup. 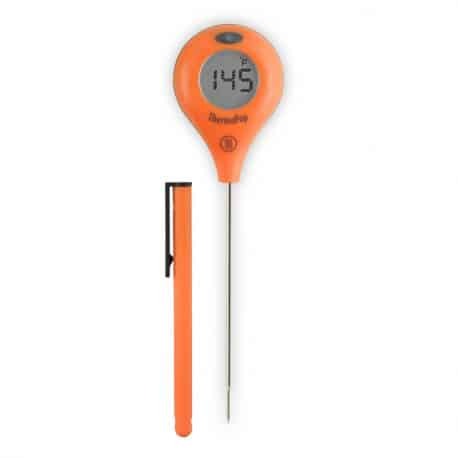 The Joule by ChefSteps is a bluetooth operated and monitored sous vide machine that simply sits in any pot or cooking vessel and gently heats and circulates the water to keep it at the temperature that you set. In this way foods such as meat and vegetables are cooked perfectly every time with little to no moisture loss unlike dry-heat cooking. If you are interested in sous vide cooking, this is a great way to get started! 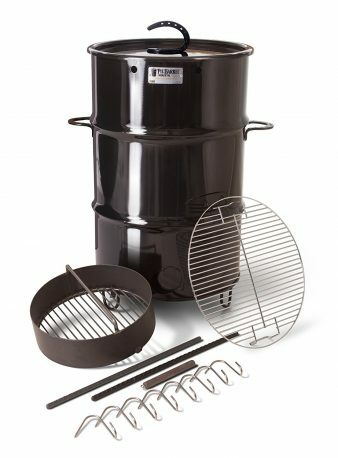 The Pit Barrel Cooker is a cooker that takes all of the guesswork out of producing amazing tasting food. Fill the charcoal pan level with charcoal, remove 40 of them and start them in a charcoal chimney. Place the charcoal pan down in the bottom of the barrel and when the 40 pieces are burning good, pour them on top of the other charcoal in the barrel. Hang the meat, replace the lid and walk away. I've cooked ribs and Thanksgiving turkeys in this thing and it might be accused of being too easy. If you love using charcoal but want that set it and forget it type of cooking then this cooker is for you. It does cook a little hotter than other typical smokers so food gets done faster. Mine seems to run between 275-300°F and ribs take 2.5 to 3 hours to reach tenderness. 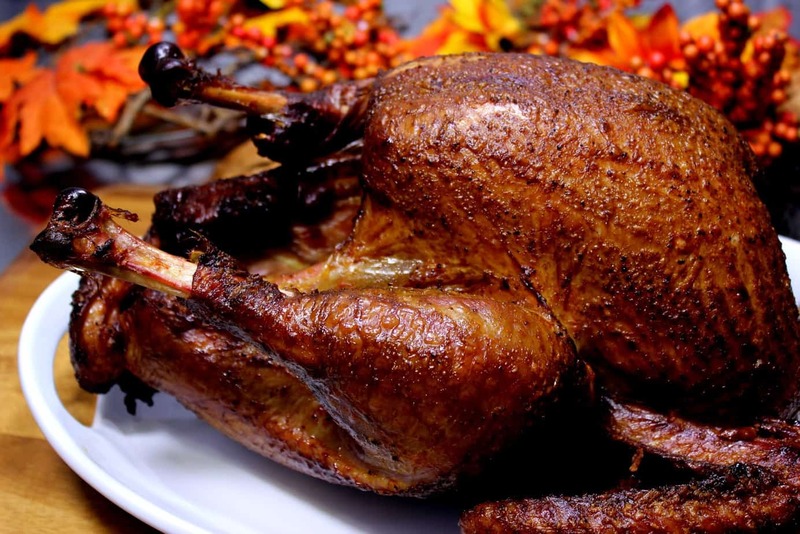 A 12 pound bird was finished to perfection in only 4 hours. The original setup of charcoal will keep the cooker hot and cooking for 8 to 9 hours. I highly recommend this cooker! For years now, the Weber smoky mountain has been the leader in bullet style charcoal smokers and entire websites are devoted to this smoker alone. The design allows it to cook for long hours with minimal amounts of charcoal and very little tinkering of the vents. Using the minion method from my website and online, you can set up this smoker to maintain steady heat of about 225°F for 12-16 hours while you sleep, go to work or do other things. I have the 22-inch version but it also comes in a 14-inch and a 18-inch version if you are interested in the smaller size. 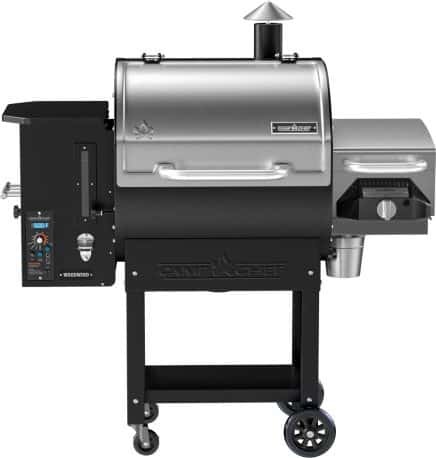 The Woodwind SG by Camp Chef is the best pellet smoker for the price in my opinion and with all of the well thought out features, you'll agree. I love the easy ash clean-out feature and the dump chute on the pellet hopper just to name a few of the extras. 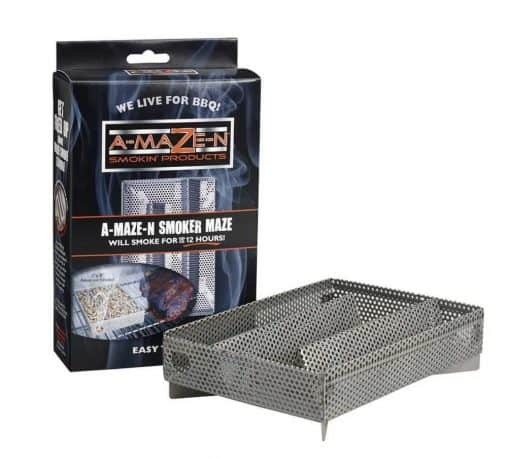 The large hopper holds 22 lbs of pellets and for some flame kissed action, the bottom heat shield slides out of the way via a lever on the outside of the smoker to allow the flames to leap up to the grate. If you have need of searing steaks, burgers, chicken, etc. this comes with a 900°F propane fueled sear-box that attaches to the right side of the unit. 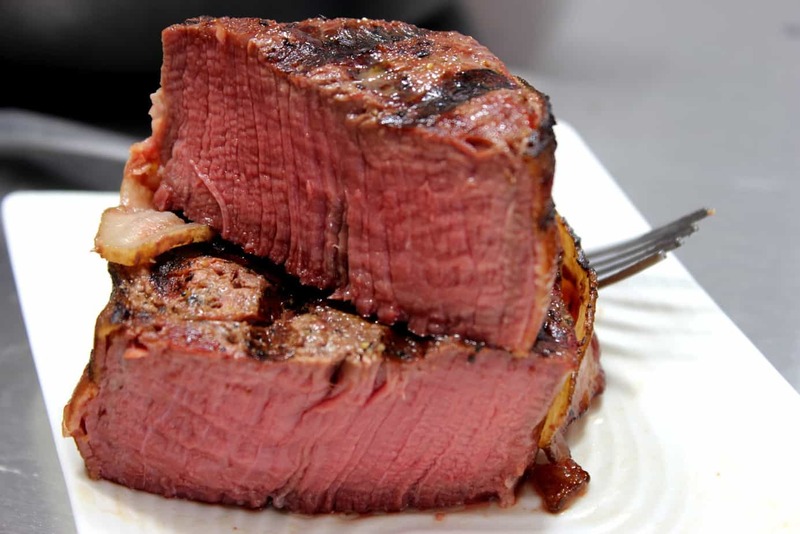 In this way, steaks can be smoked to about 110°F and then placed on the sear box, to bring them up to a perfect medium rare with beautiful sear marks to boot. 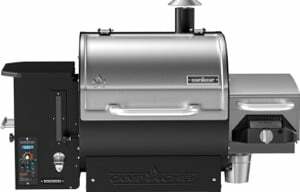 Note: The pellet smoker is normally $999 but is on sale right now for $100 off the normal price! Thank you, Megan. I will check on that. I currently have a Bradley Electric Digital Smoker . I am looking to upgrade and was wondering what would you recommend? 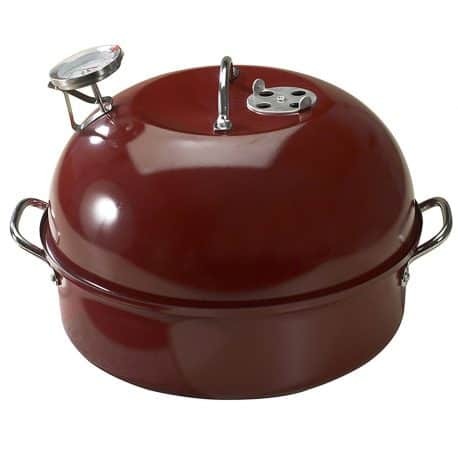 I just ordered the Nordic Ware Stove Top Cooker from your link to Amazon. Will wood pellets work instead of saw dust? I have big bags of those. If not, if I crush the pellets then I will have saw dust. I thought perhaps you have tried the pellets and could share that info. Congratulations on your purchase.. 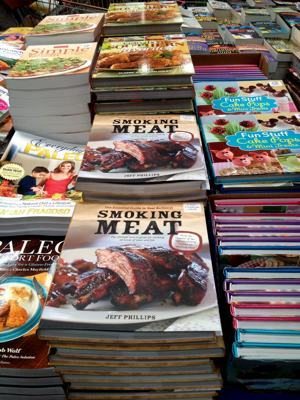 I think you’ll really like it for getting a little smoke flavor indoors. I have not tried pellets as I have a large supply of wood dust but I don’t see why it wouldn’t work unless it perhaps creates more smoke that way. If you try it out, I’d love to hear how it goes. 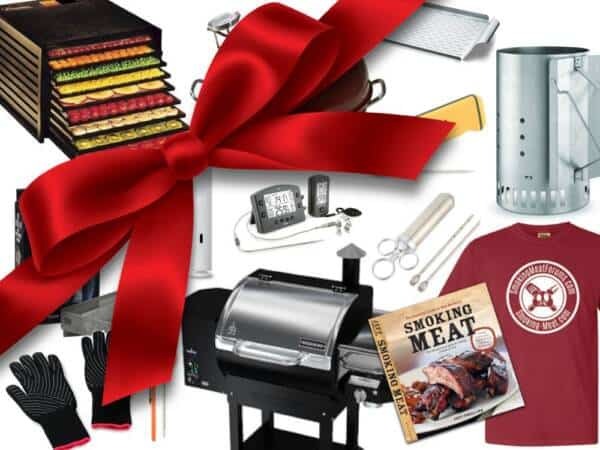 Confusing- it sounds as though you are promoting a “Holiday Special” of sorts for the Woodwind Camp Chef smoker/grill at $699 for the grill WITH the sear box!! But there is no evidence of that on the site from the provided link. If that IS the case- I’m in!!!! Sorry for the confusion.. at the bottom of the description I stated the price with and without the sear box.. it is an add-on since some people will want it, some will not. I think the sear box adds a really nice feature to the smoker but it’s also an excellent pellet smoker with a lot of features without it.